It's been a long time since the last update but here it is: the new resource system. This update adds a lot new features to the game and changes the way resources are obtained in single- and multiplayer-games. The new management mode replaces the "specator"-mode in the menu and add the functionality to manage all blocks, not just producers. The menu on the bottom-left corner now shows information about the object that was selected. This was necessary as many new objects were added in this update (read below). You can now place producers where you want to, they don't have fixed positions anymore. They are now special-objects but can only be placed on the floor and do not have physics (except for the object/sphere on top the block). 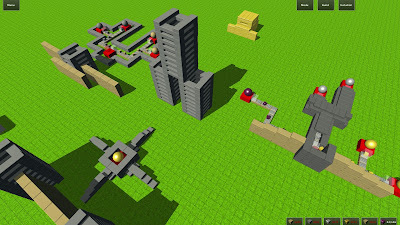 In this update I added energy as a new type of resource (+producer) that is needed to power several blocks. Unlike the other producers, the energy-producer doesn't add energy in specific intervals. Depending on the level of it, you have a specific amount of energy available. For example: If you have 30 energy available you can power 15 objects that need 2 energy(-units) at a time. This is probably the biggest change to the game. Producers don't add resources anymore, instead they spawn resource-blocks. These blocks need to be transported to a warehouse. This is done with conveyor-belts. 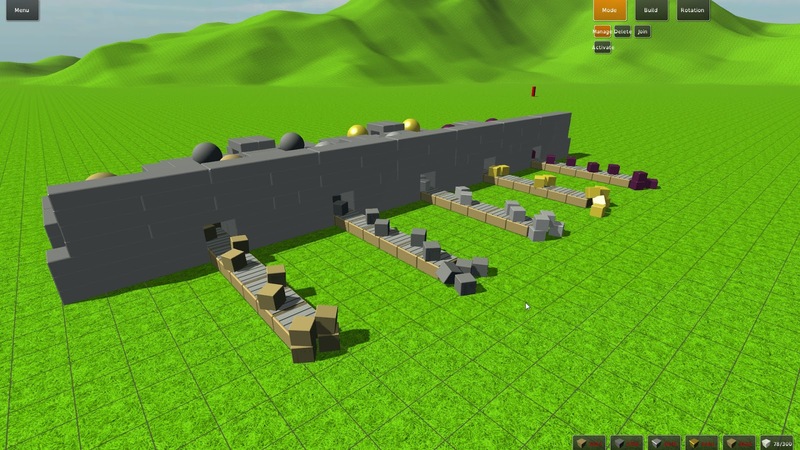 The conveyor-belt is a new special block that is used to transport resource-blocks from the producer to a warehouse. It is also the first block that needs energy. If no energy is available, the belt stops and the resources are not transported to the warehouse. Warehouses are the place where resource-blocks need to be transported. Warehouses have a global repository and can be upgraded to be able to store more resources. In this update I also improved the camera-movement. You can now control the camera with your keyboard with the keys W,A,S,D. Furthermore you can hold [left-shift] to slow down the speed of the camera. This can be used to create videos with nice camera movements. I added tooltips to the menu because without them you couldn't see how much everything costs to place and sometimes it wasn't clear what a button does. The costs for all blocks and inventions are now shown in the menu (+costs to update producers, warehouses,...). Added tooltips to show costs of different objects and to describe different tools and buttons. By clicking on object, menu with information and actions for the block shown up. Producers now produce resource-block which need to be transported to a warehouse with conveyor-belts. Warehouses have a global repository, need to be upgraded to increase capacity. Like I already said it's been a long time and I didn't expect it to take such a long time (some things turned out to be harder to implement than I thought ;) ). My plan from now on is to release a new video every 1-2 weeks. Hope you like it, if you have any feedback just write a comment below.